Imagine boarding a plane on an early December afternoon and after a short flight, arriving at the North Pole. Your destination is an airplane hangar filled with magical decorations and happy things like Santa and Mrs. Claus, elves, food, cookies, and even presents. 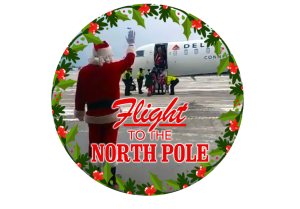 Flight to the North Pole allows sick children and their families to take a break from reality and forget they are sick, if just for a few hours. This event takes place each year, with flights taking off from Mitchell International Airport in Milwaukee. This year there were 25 participating families, including 60 kids, both those who are ill and their siblings. In 2018, HRG split up the funds we had raised all year and left it to each department to donate to one or more organizations of their choice. When I saw the Flight to the North Pole elves raising money for their cause, I knew it was something I wanted to share with the others in my department. I believe Christmas is for kids, and their circumstances aren’t controlled by them. I wanted to support a charity that brings them joy. After some investigation, we found there were several ways the families are supported. Besides money, they asked for family gift baskets to make their lives a little easier, gift cards to local grocery stores to help offset the cost of a meal, or money to sponsor a family to help cover their expenses for the day. As a group, we decided to do the latter because it seemed to have the greatest impact for the amount we had to donate. Because we had chosen to use our allocated funds to support three different charities, many of those in my department donated additional money to cover the cost of sponsorship. Though I wasn’t able to witness it first hand, I’d like to think we helped bring some special memories to the kids and their families on that special day. It’s this culture of giving that is one of the reasons I enjoy working at HRG. Throughout this Tradition of Giving blog series, you will learn other heartwarming ways my colleagues gave unto others. I hope their stories inspire you as they inspire me!